Oh what a difference an interpretation can make. One has to wonder if, after having seen both Gone Girl and Dark Places, which might have been the bigger success had the directors of each switched projects. One could argue the phenomenon of Gone Girl wasn't as much due in large to David Fincher's direction, but more the universal themes of relationships, cheating husbands and the acknowledgement of a very real presence in the exploitation of bad news for good ratings, but I wouldn't. I would argue these elements and the style with which they were presented heavily influenced what audiences took away from the film and that the story is wholly indebted to Fincher's direction. Don't get me wrong, Flynn's Gone novel is a well-written piece of noir that is highlighted by it's alternating narrators and cynical introspection, but it could just have easily been turned into a Lifetime movie and that is the difference between it and Dark Places. Written for the screen and directed by Gilles Paquet-Brenner (Sarah's Key) Dark Places attempts to cover all of the seeming ideas and themes floating around in it's source material (I didn't read this Flynn novel prior to seeing the film) where with Gone Girl (I did read this one) Fincher chose to focus on one major theme and let whatever else came to the surface come out of that one focal area. 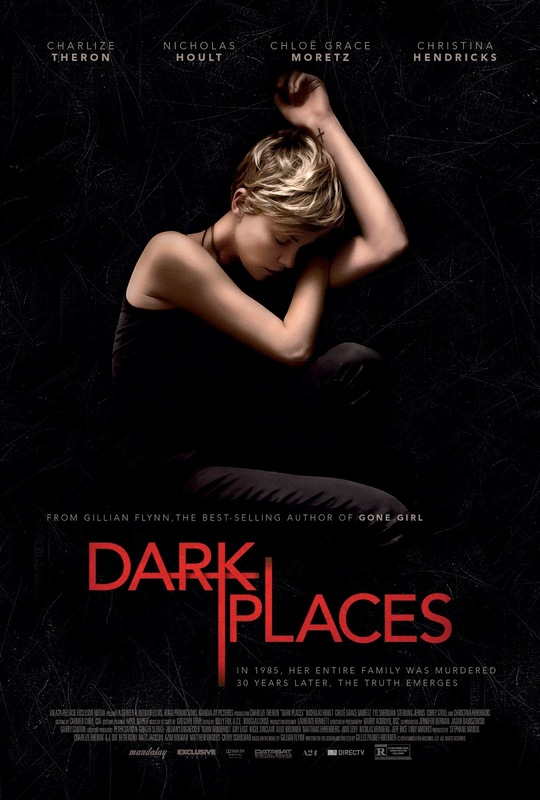 This isn't to say Dark Places is necessarily a failure as a different approach could certainly work with similar material, but in Paquet-Brenner attempting to cram as much as he can into a two-hour movie the film eventually devolves into a standard procedural of uncovering the core mystery rather than being any kind of meditation on the factors that inform the mystery. Lyle Wirth (Nicholas Hoult) and Libby Day (Charlize Theron) explore Libby's past in Dark Places. While the story around why Dark Places isn't near the event that Gone Girl was less than a year ago while more or less being the same property is potentially more interesting than the one the film actually tells, it comes down to the simple fact the film isn't as riveting. I hate to continue comparing the two films, but it's inevitable, really. It's inevitable because like with Gone Girl and it's sly commentary on the media attention that missing persons cases attract and how they immediately indict the lousy husband branding him for life no matter if they end up wrong or not, Dark Places has hints of something just as culturally fascinating on the same wavelength. One can see such inspired moments of possibility within the first few scenes of the film. When Charlize Theron's Libby Day meets with what seems to be her financial advisor in Glenn Morshower the two talk of concerns about her running out of donation money and how much longer she can hold out on getting a real job by milking her status as the lone survivor of a family massacre. It seems, that in the twenty-five years since her family was murdered, she has survived on anonymous donations, book deals and no doubt many other engagements she was handsomely reimbursed for. Rather than making this a point of inspection and evaluating not only the effects of being a sole survivor of a murder that took away everyone you love, but how that loss evolves over time into the sole reason to exist-the film almost ignores character development completely. Libby is essentially given no choice but to become this idea of what other people imagine her to be given the news stories they've seen. Libby has no idea how to escape this. All of this would seemingly make audiences sympathetic towards Theron's Libby, but strangely it is difficult to even like the woman. Still, it's unfortunate the one night Libby would most like to forget has become all she is known for and the reason she can't hope to live a normal life, much less make money in any traditional fashion. Instead of delving into these waters though, this need for cash simply serves as a plot device for Libby to agree to participating in a new investigation into the murders of her family led by an inherently creepy fellow named Lyle Wirth (Nicholas Hoult, ineffective as ever here). The murders themselves consist of Libby's mother, Patty (Christna Hendricks, who is rather affecting in her supporting role), and Libby's two sisters, Michelle and Debby (Natalie Precht, Madison McGuire), being killed in 1985 when she was just a child, presumably by her brother, Ben (played by Tye Sheridan in the 1985 sections and Corey Stoll in present day). It is shortly after Libby's discussion with Morshower's character that she comes to meet Lyle who tells her he is part of a local "kill club" that believes her brother might be innocent. From the moment we meet Hoult's character we can feel the strain of the story's plotting just itching to find a way to get Libby back on the trail of what has engulfed her life and that she still can't allude. Of course, she could if she wanted to, but that's another point neither Paquet-Brenner nor Theron seem to care to explore within Libby as a character. Instead we move forward rather quickly, glossing over a piece of dialogue that comes to play a major role later in the film. The film feels so poorly constructed though that it's almost as if this line of dialogue were tacked on in ADR sessions so as to try and make the reveal more impactful. The film goes back and forth between flashbacks and present day. The flashbacks serving as a way for the film to build on the events of what actually happened the night of the murders while the present day keeping in time as Theron's thirty-something Day uncovers clues to figure out for herself what happened that night. 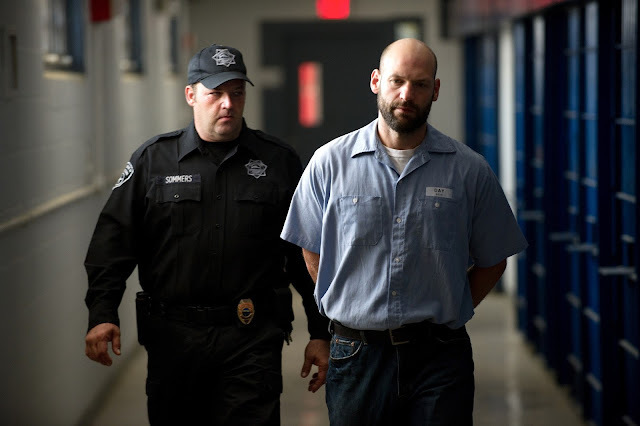 Ben Day (Corey Stoll) has been sentenced to life in prison for the murder of his family. The murder/mystery plot is a fine jumping off point even if it doesn't feel as fresh as what the film could have tackled, but as the story plays out it only becomes more cluttered to the point we hardly care about the outcome. While I'll stay away from spoiling anything or highlighting plot points that are present merely to serve as misdirection, Dark Places hits its stride only when it's seeming murderer is on screen. Whether it be when grown-up Libby goes to visit Ben, who has been sentenced to life in prison, for the first time or when we are getting to know Ben as a teenager in 1985, the scenes crackle. Both Sheridan and Stoll turn in rather riveting performances given the circumstances they have to work within while the misunderstandings of Sheridan's version are what come through as the most insightful pieces in the film. These scenes involve a pregnant, cigarette-smoking, cocaine-snorting Chloë Grace Moretz playing the role of the pretty girl that let a young, outcast kid like Ben get close to her and call her his girlfriend. Ben has clearly always been something of a socially awkward guy, but more importantly Sheridan shows how impressionable the kid can be. From this, we gather that Moretz's Diondra and local bookie Trey (Shannon Kook) were the only one's willing to give Ben a shot and so he went along with their penchant for devil worship and heavy metal music, though he always seemed aware it was against his better judgement. A more fascinating film could have likely been made out of the tragedy that is Ben's life rather than that of Libby's, but the choice of narrator is understood for the sake of the mystery. In the end, the Gone Girl comparisons may be unfair and they may even have set too high of expectations for whatever intentions the film version of Dark Places had to begin with, but they are still inevitable. Paquet-Brenner has crafted a film that would have been found middling were there a Gone Girl or not. Dark Places would be praised for it's strong and committed performances as well as the interesting southern, gothic tone it elicits, but it is the way in which the director has chosen to convey this material that squanders it's potential and would have no doubt been called out for doing so regardless. When it comes down to it, Dark Places reduces thought-provoking portraits of people giving painfully honest explanations of their actions into another Lifetime original dealing in authentic tragedy that the masses simply latch on to as entertainment.